The Bond No. 9 collection of women’s, men’s, and unisex eaux de parfum — has a dual mission: To restore artistry to perfumery, and to mark every New York neighborhood with a scent of its own. Each fragrance represents a specific downtown, midtown, or uptown locale or a city-wide sensibility. Bond No. 9 has a variety of different collection lines, but the “I Love New York” (sometimes spelled elsewhere as “I Love NY”) line is intended to be a special post-9/11 homage to the whole state of New York. 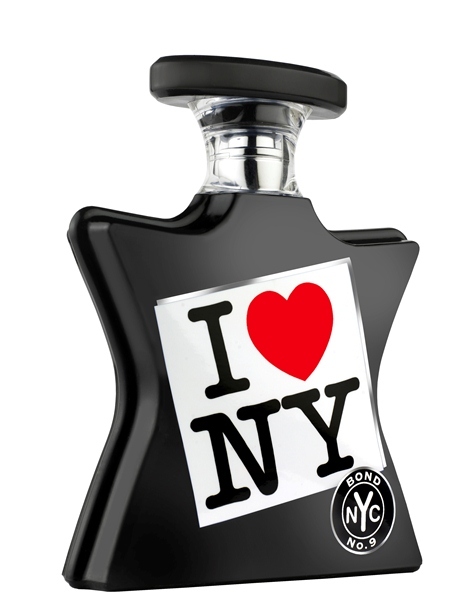 Released in September 2011, ten years after the horrors of that day, “I Love New York” began with three perfumes (For Him, For Her, and For All) and will soon expand to number many others fragrances. I think there may be nine in the line by now (For Marriage Equality, For Mothers, For Father’s, For Earth Day, etc. ), but I’m not certain of the final total. Sephora began to carry a few Bond No. 9 fragrances as of March 2013, so I thought this would be a good time to start exploring the line. There is enormous adoration for the big fan favorite, Chinatown, as well as for New Haarlem, but I thought I would start with the “I Love New York” collection since that is what Sephora carries. I chose “I Love New York For All” because it’s essentially a coffee scent and… well, I have a slight problem with caffeine over-consumption. velvety smooth yet sense-awakening—like a really good and fresh cup of java laden with cream. In fact, at the heart of this warmth-inducing gourmand’s delight is an infusion of coffee beans with soothing but slightly spicy cacao natural and tantalizing creamy chestnut. But those aren’t the first flavors you smell. At the outset, a gentle wake-up call: a citrus-floral-spice blend of bergamot, lily of the valley, and pepper. Top-notes usually aren’t as softspoken as these, but for sure your attention is riveted, and remains so as the coffee aroma begins percolating. The mellowness is sustained at the end with base notes of exotic, always-entrancing patchouli, animal leatherwood, hypnotic sandalwood, and, adding a rum-like kicker, vanilla. bergamot, muguet, lily of the valley, pepper, coffee beans, cacao, creamy chestnut, patchouli, vanilla, leatherwood and sandalwood. Oddly enough, the carded manufacturer’s sample that I have also lists “full-bodied geranium,” which is not on the notes on either Bond No. 9’s website nor on Fragrantica. It is, however, most definitely part of the perfume and a big part of its opening. I Love New York For All has a crazy, crazy start! Utterly schizophrenic and unusual — not in a good way, either. It begins all green, black and brown: heavy green geranium leaves; spicy, biting, sharp, pungent black pepper and acrid smoke; and brown woods. There is an occasional note of chestnuts, like marron glacé, which pops up somewhere in the mix, as well as vague hints of patchouli. And yes, there is a vague, fleeting impression of coffee, but it’s nothing like actual coffee. Not even remotely. I had to look up “leatherwood” to see if it was responsible for the extremely unpleasant, medicinal note of smoke and woods. After doing some digging around, I still don’t know what it is. Wikipedia states, rather unhelpfully, that it might be one of several different kinds of plants or shrubs, possibly a tree. Whatever it is, I’m sure it’s something with a definite smoky, peppery wood aroma that, here, is similar to either cedar or cypress. Perhaps, even agarwood oud, as it’s got a heavily medicinal aspect to go along with the dark wood note. And, yet, despite that very acrid, bitter, sharp note, there is an incredible sweetness to I Love New York For All. It’s sickly sweet, revoltingly cloying, synthetic and chemical — and it churns my stomach. The combination of it with the geranium — so green that you can almost smell the fuzz on the leaves — and with that acrid pepper and dry wood made me want to dry-heave at my desk. The nauseating mélange softens after fifteen minutes, but only just barely. Chestnut, cardamom, vanilla and ersatz coffee impression become much more noticeable, with a definite chocolate edge to the whole green-brown mess. As time passes, the brown notes overtake the green and black ones, though the synthetic trumps all. I think it’s meant to be vanilla, and it does eventually turn into something less chemical, but for the first hour, it’s beyond painful. It’s hard to explain what that note is really and truly like, but it feels like medicine. Almost antiseptically sharp and unnatural. it does a fairly masterful job of straddling the fine line between being overly feminine and butchy-masculine. Can I find fault with the vanilla? A bit, as it makes the concoction sweet, perhaps overly so in some respects. It could likely do without it, but it wouldn’t be quite the same and probably lack a broader appeal. Having read that, I think it might be the vanilla note which is causing me so much misery, along with its manifestation in conjunction with some other, extremely discordant elements. Or, maybe, it’s the cedary woods having turned the vanilla? Whatever it is, the result is something too harshly synthetic and chemical, with medicinal undertones. geez all I get is medicine, bitter medicinal notes almost annoying like the medicine has gone bad kind of smell. Or almost like opening a wooden medicine cabinet where the medicine fragrance has taken over the wooden cabinet with just a hint of the wood like cedar or some other fragrant wood. Not recommended. […] I usually love cacao, chocolate notes but it’s just not working for me here. And I was really hoping it would because I’m a huge fan of gourmands but I wouldn’t call this a gourmand! Sorry! Based on the notes I thought I would love this since I love sweet gourmand fragrances. But when I got to test this , what a shocker. Like a combination of all the notes but gone stale. Just a sickly sweet stale scent. Smells like chocolate when it turns bright and flakey with some medicine poured over it. I could not tolerate this at all. In all fairness, however, the perfume has a number of rave reviews on Fragrantica. A large number of people seem to have had a very, very different experience with the smell. Some called it a chocolate scent, others a coffee one. A few changed their minds completely on it, going from dislike over the peppery notes to a much greater appreciation. A handful compared it to “popcorn” (which I don’t agree with) or to cinnamon waffle cones. I did notice that the vanilla tamed after two hours and, yes, turned to something vaguely reminiscent of waffle cones, albeit very chemically artificial ones. I couldn’t tolerate I Love New York For All to see how it further developed. I lasted 2.5 hours before I waved the white flag and had to scrub it off. By the end of that period, the nausea was just too great. I don’t mind gourmand fragrances is done properly, but there is nothing rich, luxurious and natural about the Bond No. 9 take on things. It’s not like a Guerlain gourmand fragrance, for example. No, I Love New York For All takes sweet to a whole new and very sickly level with synthetic notes. Then, it tosses sweetness into a mix that involves acrid woods, over-done biting black pepper, cocoa and geranium (!) for a combination that is simply unbalanced in every possible way. I can’t even begin to imagine what it would be like if I actually smelled lily-of-the-valley, bergamot and muguet in that unholy mélange. I Love NY For All is available on the Bond No. 9 website where it costs $105 for a 1.7 oz/50 ml bottle and $175 for a 3.5 oz/100 ml bottle. Bond also offers a limited-edition eau de parfum version of the scent with a charm necklace for $255 for 3.3 oz. There is free ground shipping within the US for all purchases, but international shipping seems crazily high at $150!! (Surely that must be a typo!) You can also find the perfume at Sephora which seems to offer accompanying products such as body lotions and a body wash. Nordstrom also carries it for the same prices, along with the limited-edition $255 eau de parfum version. Saks Fifth Avenue has it as well and seems to be the retailer with which Bond No. 9 works most closely. In Canada, you can find Bond No. 9 at The Bay where it costs CAD $120 for a small and CAD$200 for a large bottle. In the UK, Harrods seems to carry all of Bond No. 9’s “I Love NY” line except for I Love NY For All. In Russia, Bond No. 9 is carried at TSUM. In Dubai, the line is available at Paris Gallery.